When it comes to recliners, nobody has more knowledge or history than La Z Boy. Sure more recent time has spawned their full collection of living room furniture including seating for every application but the recliner remains their forte. I am pleasantly surprised to see the “Carlyle” that has design inspiration dating back to the art deco era of the 1930’s. 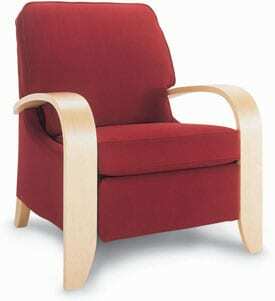 I especially like the curved Maple arms that contrast the straight lines of the boxed border seat and back. Overall – Height: 39.5″ Width: 32.5″ Depth: 39″ Seat – Height: 20.5″ Width: 22″ Depth: 21″ The La Z Boy website can help you visualize all the fabric options with the “Customize Products” helper.